The Global Forum on Agricultural Research (GFAR), the Collaborative Programme of Participatory Plant Breeding in Mesoamerica, implemented in local communities of the Sierra de los Cuchumatanes by the Farmer Organization Asociación de Organizaciones de los Cuchumatanes (ASOCUCH) and the Foundation for Agricultural Technological and Forestry Innovation (FUNDIT), with the financial support of the Development Fund of Norway, present these capacity-building materials for local and indigenous agricultural communities on a matter that is of great importance nowadays: the need and importance of recognizing and implementing farmers’ rights. They are intended for small-holder farmer leaders and decision makers live and depend in a direct way on family agriculture. 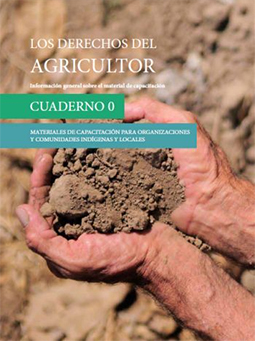 These materials are expected to inform the agricultural indigenous and local communities on the recognition and protection of farmers' rights, helping to strengthen communities in understanding and implementing their rights. More capacity-building materials will be developed for smallholder farmers in other countries of Latin America and other regions, such as Asia, Africa and Near East.